Around this time last year, I wrote about the value of derivative fiction, and how there is little true originality left in the world. This isn’t a bad thing, necessarily; after all, most stories follow similar plot lines (see virtually every one of Marvel’s superhero movies), which can provide a sense of comfort to the audience. It’s exhilarating to see the dangers faced by the hero, but safe to know they’ll survive at the end. In derivative fiction, we are essentially seeing the effect of influence: what occurs in one story will occur in all its unrelated successors, tweaked and modified of course, but still recognizable. When I started writing The Redemption of Erâth, I knew well that I was playing into the fantasy tropes of the orphaned farm boy in a world overrun by darkness, but I felt I had a story—within those confines—that had yet to be told by any other. And so far, the story has taken shape in a way that not only veers somewhat from the groundwork laid out by Tolkien but has been entirely unexpected to me as the author. But this is what happens when the story you’re telling is—knowingly or not—influenced by the stories you learned before you started writing. What about when a story you’ve been working on—sometimes for years—turns out to be similar to one you never even knew existed? Is it possible for someone else to tell your story? This is the position I found myself in when I published my contemporary young adult novel, 22 Scars, last year. It’s a book I’d worked on for over a decade. I thought I knew my references; I thought I knew my influences. 22 Scars tells the story of a teenage girl, falling into a spiral of depression and self-harm in the wake of trauma and abuse. The inspiration for 22 Scars was the 2004 album Invisible Circles by Dutch gothic metal band After Forever, a concept album about an unloved and unwanted child. The inspiration was my own life, growing up with chronic depression and mental illness. It was my own (considerably more than twenty-two) scars. I knew that young adult books about loneliness and depression were not uncommon, but I’d never come across one that dealt so directly with suicide and self-harm as I intended with 22 Scars. The first sign I had that things were not so unique as I thought was when Netflix announced an adaptation of Jay Asher’s groundbreaking Thirteen Reasons Why. I hadn’t, in fact, read the book—I hadn’t even come across it at that point—but I was immediately concerned. Here was a story about a teenage girl who takes her own life for some of the very same reasons that my character, Amy, ideates about suicide herself. What were the odds? And what would people think of my story now? Would it be considered derivative? Would it be considered plagiarism? But I plunged forward because I had faith that my story was my story. I knew that the events I described, whilst similar, couldn’t be the same, because they were my events, my stories; they were based on my own life. And my storytelling was different. Jay Asher’s was unique, and mine didn’t copy his at all. 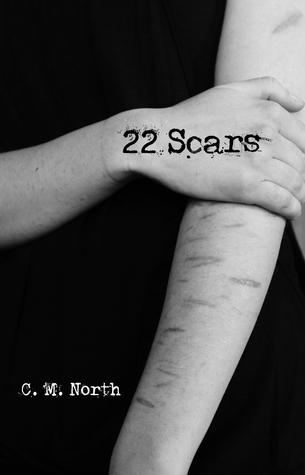 22 Scars was published in November last year. It’s done reasonably well, I feel—maintaining around a 4/5 on most review sites—particularly considering its subject matter and tone. As Donna pointed out in her review of it, the storytelling might not be for everyone—stylistic choices I made in keeping Amy’s emotions distant until the end have been off-putting to some. But I was happy with it and happy that people were reading it. And that’s when I discovered not one, but two stories that deal with almost exactly the same issues. Both predate 22 Scars by quite some time. Both deal with teenage girls who self-harm. Both are written in first-person present tense. The first is Cut by Patricia McCormick. It deals with a girl’s stay in a mental hospital, trying to cope with her self-harm and the events that led to her behavior. I’m less worried about that one. The other is entitled Scars. It details the story of a teenage girl who was sexually abused as a child, and who cuts to cope with the emotional turmoil and pain. It includes unhelpful parents, gay characters and hidden memories of abuse. I swear I’d never heard of this book until about a month ago. And it scared me a little because it has so many parallels to my own 22 Scars—from the title to the content to the storytelling. What would people think of my own book if they knew how similar it was to one that had been published seven years previously? For a while, I was concerned. But then it occurred to me: each of these stories—Cut, Scars, Thirteen Reasons Why—they were all the product of their own authors’ experiences, lives, and dreams. As is 22 Scars. And if there are parallels, it’s because these things happen all too frequently, and perhaps we need to talk about it more. Perhaps there are countless similar stories out there, with tellers too afraid to speak up. At the end of the day, my own story also includes a lot that isn’t in these other tales. And where every other book I’ve since come across ends on a note of hope … I’ve left mine a little more ambiguous. As one reviewer noted, “the author leaves it up to us to decide the ending for ourselves. Almost as if it is up to us to decide to live or die.” This was a deliberate choice; after all, life isn’t always full of happy endings, but I do believe it is up to us to make the most of the life we have given to us. Eventually, I’m certain my book will find a place to stand in its own right, apart from the shadow of these greater tomes. Until then, I can continue to have the faith that what I’ve written comes from me, and isn’t derivative—because that isn’t how I wrote it. Of course, it’s up to the readers to make up their own minds. C.M. North is a trained musician, coffee addict and author of 22 Scars, a young adult novel about teenage depression and growing up with tragedy and trauma. He lives in northern New Jersey with his wife, son and cat Pia, who insists she take precedence over writing. You can find him at cmnorthauthor.com.